People and businesses who ‘Love The Forest’ have come out in force to help fund projects to keep the New Forest special for years to come. The Love the Forest visitor gift scheme encourages visitors to donate or adds a pound to their hotel, restaurant bills, or product sales which are then given out in community grants for conservation and education projects. Last financial year nearly £28,000 was raised. Over 30 businesses are taking part, including Greenclose Hotels (the Montagu Arms Hotel, Beaulieu, and Careys Manor, Brockenhurst) which has raised nearly £20,000 since 2007; New Forest Ice Cream which has raised £2,500 through sales of peach melba ice cream since 2013; and the Balmer Lawn Hotel, Brockenhurst, which raised £30,000 over eight years. The scheme is part of the New Forest Trust charity and is administered with help from the New Forest National Park Authority. Grants of up to £5,000 are available and more organisations are encouraged to apply. Calshot Nature Club is one of the projects to benefit from a recent Love The Forest grant. 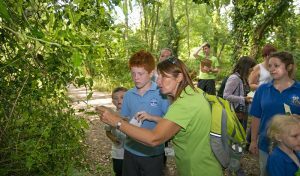 Club leader Viv Drake said the £720 funding provided after-school sessions for families to help them learn more about New Forest habitats, wildlife and the commoning system. Visits included meeting a Forest keeper, seeing charcoal made at Pondhead Community Woodland in Lyndhurst and exploring the reptile centre near Lyndhurst. Nearly 20 adults and children attend the club. Viv said: ‘The sessions are very informal and hands-on. The families say they always learn something and really enjoy it and look forward to coming each week. Alison and Chris Wilson own the Balmer Lawn Hotel, Brockenhurst, which adds a discretionary £1 to leisure visitors’ accommodation bills which it donates to the Love the Forest scheme. They are celebrating reaching their £30,000 total. Calshot Nature Club hopes to continue every Wednesday in term time from 12 September meeting at St George’s Hall, Calshot. Details will be on the club’s Facebook page.